This Spirit Space house article explores the differences between the way of spirit and that of religion. Opening ones mind to all things of the spirit, how might this begin? First, it is seldom if ever done with an attitude of absolute dictate, dogma or judgment, those things which are common place within religion, especially those of the god dominant. For instance, religions which focus upon the Bible only tend to discourage individual thought and path, thus ending any vision which might come with a different way of understanding existence. 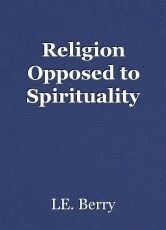 What those of religion want is complete agreement and not true spirituality. The course of spirit is not always of agreeing and it is not of being led, that which is the apex of most religion. The practice of Tarot, Astrology, and of seeking the spirit realm, along with other types of personal ritual not condoned by standard god dominant religion, has at best been deemed silly and useless, and at worst called evil by many religious people. The way of the spirit is of always keeping an open mind and heart as you seek to grow in spirit knowledge and true wisdom, free of all confining dictate. An interesting read. Your remarks about religion come very close to my ideas about belief systems. I think the way a lot of people think about spiritual matters is quite different from what organized religions do with those spiritual urges. I think religions are the powerhouses that manipulate the spiritual needs for their own ulterior motives, having very little to do with the ideas and values that form the basis of those religions. In that sense, religions are a lot like political parties, where very mundane practicalities also take over from ideology. In my opinion that is a form of ideological corruption used to increase the power of those in charge of the belief system. Biography MSG Russell D. Ganong USA Ret.